I never thought I would be cooking rasgulla myself at home when until recently I was at my uncle’s place for lunch. Any meal is incomplete without a sweet; yummy rasgulla completed the perfect Gujju meal. It was then and there, I was tempted to cook rasgulla myself at home. I browsed through various rasgulla recipes on internet. 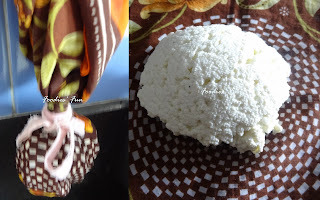 And came across this simple recipe for making rasgulla on sharmis passion blog. I cooked it once but was not successful as they cracked while cooking in sugar syrup. Second time I again tried cooking it with a little change in the ingredients. This time I added cornflour as binding agent and a little sugar while rounding paneer balls. And Yipeee I was successful making round and soft rasgulla. Take milk in a cooking pot. Switch on the gas on high flame and boil milk. As milk boils, add lemon drops one by one. Keep on stirring the milk as you add lemon drops. As you will stir continuously, milk will slowly curdle up. As milk curdles up, switch off the gas stove. Add 4 to 5 ice cubes and let them melt completely. Drain off the whey water using a strainer or channi. Tie this curdled milk in a cloth. Hang it for 30-40 minutes. After hanging it for sufficient time squeeze in the extra water. Open up the cloth and put it in a plate. Crumble the paneer. Add cornflour to it. Cornflour will act as a binding agent so rasgulla does not break when you cook it in sugar syrup or chasni. Knead the paneer with cornflour properly for about 10-15 minutes till you get smooth pliable dough. More properly you knead the paneer, softer the rasgulla will be. Make 10-12 small balls out of it. While making balls put very little sugar (less than a pinch) in it and make round balls. Keep it aside. See to it there are no cracks while you round the balls. In a heavy bottomed vessel, put water and sugar. And heat them till it boils. Sprinkle a pinch of cardamom powder for flavour. As the sugar syrup boils, slowly add balls one by one to it. Cook rasgulla on medium flame keeping it covered for 10 minutes. As you will see, the rasgulla will grow in size. The rasgullas are then done and let it cool. After sometime transfer to a small container and refrigerate it. Take out of refrigerator after 1 or 2 hours and Rasgulla is ready to be served.